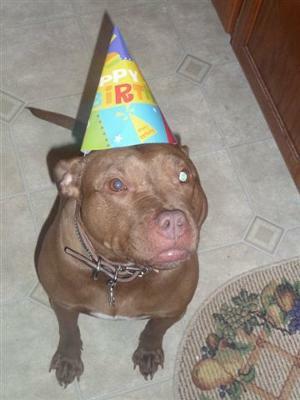 Jolene is a 2 yr old, AmStaff. I found her on Pet Finder.com, she was a residing at CampChaos in Nashville, TN. Jolene and her brother Luca were thrown out of a moving truck and suffered lots of injuries; they were pitiful. When I saw her face on the internet I knew she was the dog for me. 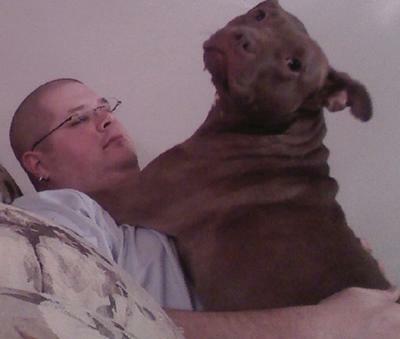 My husband was not in the least bit excited that I had just adopted a Pit Bull. Now she is the love of his life. She is the most adoring and precious thing outside of our children that we could have ever have. She is very loyal, she loves people and children. She jumps and plays with the kids like she is one of them. I would say one of her qualities is that she loves to cuddle and kiss. Though she has lots of them those are her favorites (I think). I guess the funniest thing she does is bark at styrofoam, she is absolutely terrified of it, she jumps and snarls at a paper plate, lol. She loves laying on the couch with my husband, anywhere he is she is. Jolene loves to walk, and lay in the sun. You just couldn't get a more perfect dog. My favorite breed and your is a sweetheart! Very pretty and looks so sweet! Thank you, she is one of a kind. We are so blessed to have found her.